Ever wondered how to get more Spotify plays? Are you looking to get the best Spotify promotion for your music? We’ll tell you how to gain a great amount of independent playlist spots as well as how to reach out to Spotify’s curators and Spotify’s official playlists. But let’s start from the very beginning of an artists Spotify career: Before you’ll be able to work on Spotify promotion you first have you get you music on the streaming service. You may think you need to be signed to a label to have your music on Spotify. And some labels will tell you that. Well, this is wrong and right at the same time. It is right that you can’t just upload your music to Spotify like you may be used to at Soundcloud or other open music platforms. Appearing on Spotify, Apple Music, Deezer and other streaming services requires official distribution. Thanks to the modern online music infrastructure it is super easy to get your songs on Spotify and other streaming platforms or music stores. It really is! There are several online services like CD Baby, Routenote, Distrokid, Symphony and many more. They all allow you to officially distribute your music. They may differ in some features tho; some allow you to distribute only in specific countries or very few stores; others may have all territories and stores on their programs but lack in service. You have to compare and find the one that best suits your needs. We at The Gentle Fox and most of our artists prefer working with Routenote. It is a small company from South England who do a really great job from our point of view. They’re providing the best conditions and have a very responsive customer service. Sometimes it only takes 3 days to have your music up on Spotify! Their basic deal is free and Routenote will receive 10% of your revenues. If you go premium you’ll pay 10$ upfront and keep 100% of the store’s payouts. We did the math for you and came to the conclusion that once you get to at least 60.000 plays you better go with the premium deal. Officially you’ll be appearing as your own label that they’ll ask you to name. Another plus is, that Routenote covers collecting revenues from Soundcloud too. More info how this works and deep insights on Soundcloud promotion to be found HERE. But first lets get a little further on the Spotify promotion game. How much does an artist earn from Spotify? You cannot write one specific number to answer this question. How much you’ll earn on Spotify depends on where your listeners come from and if they’re free or premium Spotify users. The numbers differ a lot. So will 1000 streams from let’s say Thailand only result in a few cents whereas 1000 streams from Norway or Japan lead to 12€ or more! On average we’re usually monitoring 3-3,50€ per 1000 plays. Of course this isn’t much compared to the old days where you sold your CD’s on gigs for 10 bugs a piece but think of it in the long term. Make good music, find the right placements for your tunes and keep enhancing both: Your production skills and your promotion game. It’s hard work but it ain’t magic to drive 50k-100k on a song a month. And if you have 10 great tunes you’ll already see a solid income between 2000-4000€ every month. Wouldn’t it be a dream to make a living just from music? The modern music infrastructure, concepts like streaming services and the abilitiy to get heard all over the planet are making this feasible. But once again, it is damn hard work! We have seen many guides preaching over and over again to share your Spotify link across your social profiles, Facebook, Twitter, Google+. Or even to put your Spotify streaming link in the “Buy” or “Free Download” Section on your Soundcloud upload. This is all ok and not wrong at all but it won’t give the big return you would expect. We’ll show you how to increase your Spotify plays without faking numbers, without buying plays! Numbers are money when it comes to Spotify and there is nothing wrong about caring about money. Music is your job or at least you want it to be! (And this guide to Spotify Promotion will hopefully get you a step further in that direction.) Every day we come across some posts on Facebook complaining about producers or musicians who aim to earn money with their art. I mean do they want us to starve? We really have to boost our earnings because musicians like everyone else needs to earn to live. Furthermore you surely want to be signed to a bigger label sooner or later. Taking your Spotify promotion up on the next level, skyrocketing stats and making money will get you closer to the point of signing a good contract. Labels want to see that you already have a solid following and the ability to gain income from your music. In terms of Spotify promotion, the key to promote your music on Spotify is playlists! In the best case scenario you will land a spot on an official Spotify playlist with hundreds of thousands or millions of followers. This would obviously give your tracks a huge push. A few thousand plays a day aren’t uncommon. However achieving official spots is super hard and you have to be real lucky. For long times each department at Spotify had their own google form. Through this musicians and labels had been able to pitch their music to relevant official curators. In most cases it was quite a struggle to get hands on these google forms. Only the Dance Music sector around Austin Kramer always communicated their list to public on Twitter and Facebook. Well, since Spotify released official pitching through Spotify for Artists or Spotify Analytics (for labels), the feature is now open for everybody. All google forms have been closed. First of all thats a great opportunity for upcoming artists. If we think about it again we can’t be sure this will change anything just because there is sooo much music our there and everybody is pitching it. And although Spotify has a bunch people listening and curating music for their official playlists, we bet they won’t be able to listen to all of it. Anyway never miss the opportunity and keep pitching your music! Make sure to give it a nice story and good background. Make it as easy as possible to understand what your artist and your music is about. Good luck!! In short: Interested in submitting your unreleased music for playlist consideration? Please head to Spotify Analytics (if you’re a label) or Spotify for Artists (if you’re an artist) to share your unreleased music with our editorial team. 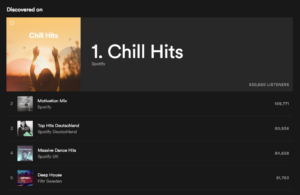 There are other ways to gain placements on Spotify: Independent Playlisters are constantly searching for cool tracks to add to their playlists. And these guys are just normal people like you and I. It’s best to search for relevant keywords like “chill”, “bounce”, “electro”, “deep house” in the spotify search, that represent your style. And get creative! What keyword may describe your music best? Ask yourself which keywords a user may be searching for, go for less crowded terms in the beginning. Then do your research and find out who is running those playlists. It’s important to take a listen to the playlists and find out if your track really suits its style. You don’t want to waste the playlisters time listening to irrelevant music. And even more important, you don’t want to waste your own time reaching out to people who won’t add your track to their playlist anyway! On the Spotify playlisters profile you can only see his or her name and the profile picture. This is usually also their Facebook profile picture. And that’s great because it allows you to search for the playlister on Facebook easily. You unfortunately cannot drop messages to people you aren’t connected with on Spotify. So either search for playlists by keywords or check out on which playlists similar artists got their music placed. Go to the artists profile and click on “More Information”. On the right side you’ll see the top 5 playlists (sorted by monthly listeners) of the artists. Click on the playlist to get more info about it and the one who’s running and curating it. Once you figured out who runs the desired playlist, you can either send them a friend request or a message and hope it’ll be accepted/read. Think about how you can add value to their playlists. Keep in mind you want something from someone you do not know, it goes a long way to simply express gratitude to them for simply listening to your track. Sooner or later you’ll surely land some spots! And you may even make some new friends while working on your Spotify promotion. By the way, most of the people you’ll be reaching out to are young scandinavians because Spotify was first launched in Sweden and Norway. Of course those were the first creating independent playlists. It’s funny that most of the guys don’t even know how they gained their followers. You see, they really don’t see their playlist as a business. It’s just a hobby. They are adding music they like personally so again: Be nice! Now listen up! There is a very very cool side effect of promoting your songs on Spotify by independent playlists. Because you won’t gain tens- or even hundreds of thousands of plays by a couple small placements. But you can fortunately trigger something bigger by these small lists. Your placements on Discover Weekly, Spotify’s Radio (means recommended songs) or Release Radar. You probably know it from your own usage. 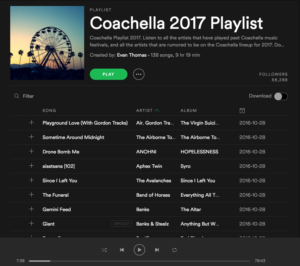 It’s the official playlists curated by a Spotify algorithm exclusively for every single Spotify user based on their listening behavior. And once your track performs great on smaller playlists, you’ll be added to the automatically curated playlists of many many Spotify users. Spotify’s Discover Weekly playlist is, same as the other automated playlists unique for every single music listener on the platform. Spotify continuously collects informtion about the users listening behaviour. They gather info on their favourite genre, if they prefer listening to happy or sad songs, if they like female voices or male voices, if they usually listen to new or old songs or even the tempo of the music, fans listening too. From all these statistics, Spotify’s algorythm finds songs a user would apparently like to listen to and set up a unique playlist tailored on his or her music listening behaviour. Further more Spotify identifies fans with the the music taste. It identifies users who are listening to similar songs and track their like and skip behaviours for example. So if someone loves your music it’ll be shown to other listeners with the same taste of music. And Spotify’s system seems to be very successful. Fans love listening to Discover Weekly! Release Radar is a playlist with a collection of freshly released songs of the artists a Spotify user is following. You see, it’ll be paying out if you encourage your fans to follow your artist acount! We’re talking about what Spotify calls radio here. Not actual broadband fm/am radio. Just wanted to make sure that this is clear to you. So Spotify’s Radio kicks in when you finished listening to a song, an album or a playlist and there is nothing else in quere. 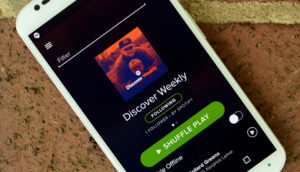 Same as Discover Weekly, Spotify will choose songs based on your listening behaviour. Great performance is a result of good quality music reaching its target audience. A situation you can induce by placing your music in the right spots, means placements on perfectly fitting playlists. Performance is measured by a wide range of statistical tools like number of plays, listening duration, ratio of adds to plays, skipping rate and so on. On the other hand this means if you push your track to playlists that don’t fit your tracks style your song may be recognized as low quality content by the Spotify algorithm. And thus less shown on the platform and its official playlists. Take your time, create good music, do your research carefully. Do Spotify promotion wisely and be nice! We’ll guarantee this practice will push your track to tens- or even hundreds of thousands of plays. And this means great exposure and more funds for your living as an artist. It’s become very easy. You don’t even have to reach 250 followers anymore. Just get access to Spotify’s Artist Insights, confirm your identity and submit your request to Spotify. Verifying your artist account is a must when you’re ready to take your Spotify Promotion to the next level. You’ll finally be able to change the designs (profile picture and banner) of your account. Furthermore you can create artist playlists and you’ll be able to pick a track or playlist as spotlight to appear first. Not least you’ll get access to your Spotify Insights. Spotify Insights will show a great overview of all your statistics on the streaming platform. Just check it out yourself and get yourself an impression on how your music performs. You can even check out which user has added which of your releases to their playlists. You can then reach out to them in future when you come up with new tunes. Furthermore you’ll be able to see your listeners’ listening behaviors and your audiences age, gender, location etc. 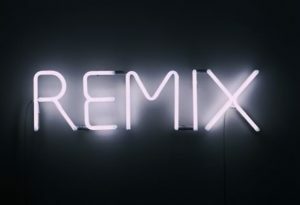 Distributing offical remixes or unofficial covers is not illegal on Spotify or other streaming platforms. Not even stores like Itunes once you have the needed rights. Fortunately, this isn’t as hard as you might think. Well, of course you cannot use uncleared samples or files from a track you remixed. Make sure to create everything on your own but it’s no issue to use someone else’s songwriting. All info about this you’ll find on Ari’s take and you can buy all necessary rights on Easy Song Licensing. You basically don’t have to buy a license for Spotify. Because they have to cover those expenses themselves but your distributer will ask for a document to make sure you have the rights. Since you’ll most likely push your tracks to stores like Itunes too. Simply buy 50-100 download licenses and once you reach those numbers get yourself some more (Don’t forget!). This shouldn’t cost you more than 20-40 €. Alright then, it’s time to push your Spotify promotion to the sky and get your tracks on some decent playlists! Good luck and be patient if it doesn’t work the first time. It will eventually, trust me! In case you’re interested feel free to have a look at our Spotify Playlist campaigns. Over the course of the past two years, countless hours of research, hundreds of emails and Facebook messages we maintained contact to a wide range of independent Spotify Playlist curators. Now we’re able to pitch our tunes, the songs of our artists and your music for consideration. Of course all this takes a lot time and many ressources. Which is why we take a fee for doing this promotional work for you. By the way, we only work with curators who run a well engaged playlist that will drive actual plays and revenue to your music. This is our promise in terms of Soundcloud- and Spotify Promotion. We have great releations to some of the biggest Spotify curators in Electronic Music, Rap/Hip Hop, Pop, Chill and for Acoustic Songs. The best thing about it is: If we can’t find you the right spot you’ll get back 100% or your money. And now for real. Get started on the Spotify promotion game! !